What happens if I ignore my hernia? What can I do to prevent getting a hernia? A hernia is sometimes described as a 'rupture’ and is found commonly as a lump in the groin area. This type of hernia is referred to by doctors as a 'primary inguinal hernia’. 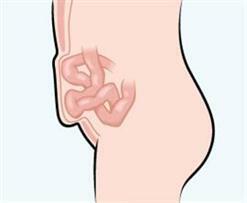 A hernia develops when a loop of the gut bulges out through a weakened part of the abdominal wall. However, hernias can occur at different sites around the abdominal wall. Hernias can occur at any age and affect both men and women. 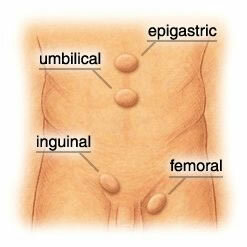 Hernias are caused, most probably, by congenital (present at birth), or age-related weaknesses in the abdominal wall. They can occur also, as a result of strenuous activity or excessive strain, for example, by heavy lifting, or with pregnancy. Often, they just seem to happen. An inguinal hernia usually presents itself as a lump in the groin area. The lump may disappear on lying flat, or may be pushed back, only to reappear when standing, coughing or straining. It can cause discomfort (or pain), which often worsens when lifting a heavy object, and tends to increase in size, with time. Occasionally, the hernia can become ‘stuck’, and very painful ("strangulated"), in which case urgent surgery might be necessary. A femoral hernia is more common in women than men (although less common than an inguinal hernia in both). It usually presents as a lump lower in the groin, near the skin crease towards the top of the thigh. It is more likely to become ‘stuck’ than an inguinal hernia and should be repaired by surgery, promptly. An epigastric hernia is caused by weakening of the muscles in the central, upper abdomen, causing a lump or bulge to appear anywhere between the breastbone and the navel. The lump can be quite small or extremely large and tends to be more common in middle age. It is best repaired by surgery. An umbilical hernia occurs at, or just around, the navel. Although very common in children, in adults, it is most common in women, often in those who have had children. An incisional hernia may occur at any site where an operation has been perfomed previously. The scar represents a weakened area, which if stretched over time, may allow the underlying intestines to bulge through. Repair is often necessary. You may notice a lump in the groin area (or elsewhere) which causes mild to moderate discomfort. On lying flat, or with pressure on the lump, it often disappears, only to return when standing, exercising, lifting or coughing. Generally, a hernia that can be pushed back easily, or flattened, is not an immediate danger to your health, although it can be uncomfortable. However, an untreated hernia will not ‘get better’ on its' own. If left untreated, it is likely that it will continue to increase in size over time and become increasingly painful. Sometimes, hernias can become ‘strangulated’, cutting off the blood supply to the gut which causes, in turn, an acute blockage. This may lead to perforation of the bowel, which then allows bacteria to escape into the abdomen and causes peritonitis. 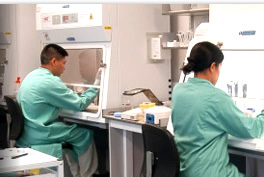 Potentially, this is a life-threatening situation which requires emergency surgery. The main symptom is usually severe pain over the hernia bulge, often with reddening of the overlying skin. Probably nothing. Hernias are very common and are experienced by many people , with both active and inactive lifestyles.